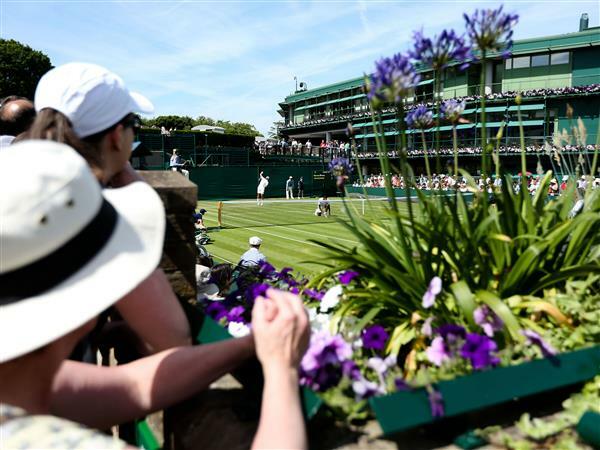 Hello and welcome to live coverage from Day Two at Wimbledon. Andy Murray, of course, is the star attraction today, but he is not on until a little bit later this afternoon. Roger Federer and Rafa Nadal are also in action, as is defending women's champion Petra Kvitova. Heather Watson will continue against Caroline Garcia after her match was suspended last night due to bad light. 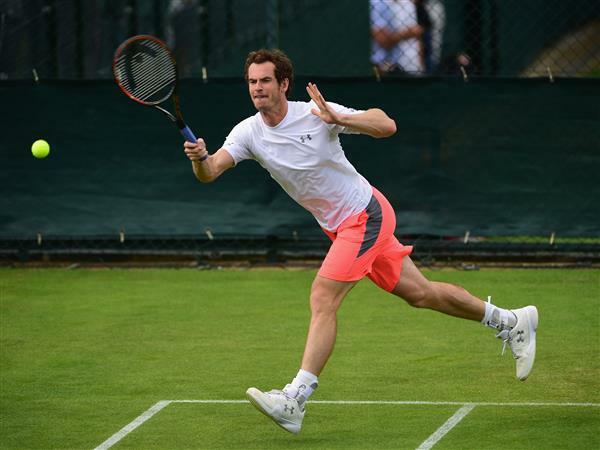 The IndependentAndy Murray has "rebuilt his identity" to put himself in contention for a second Wimbledon title, according to Tim Henman. The IndependentAs he demonstrated when becoming the first male Grand Slam champion to appoint a woman other than a family member as his coach, Andy Murray is more open to ideas than most. However, could the Scot ever imagine being coached by his wife Kim? 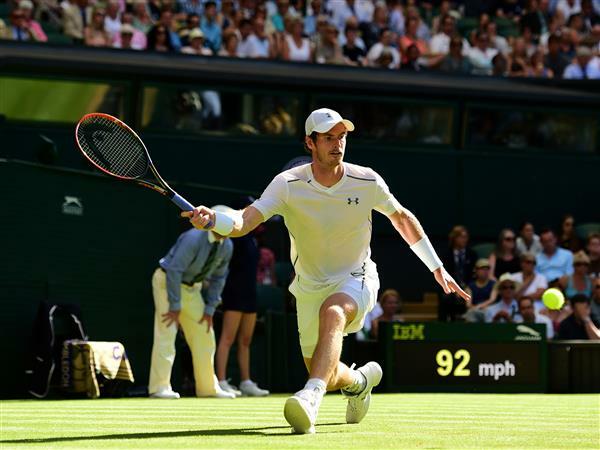 The IndependentJohn McEnroe might be confined to the commentary box these days, but his spirit evidently still prowls the courts at Wimbledon, where four different players lost their tempers under the glaring sun on the tournament’s opening day. The IndependentIt was, in a sense, an advert for women’s tennis. It barely lasted longer than one. 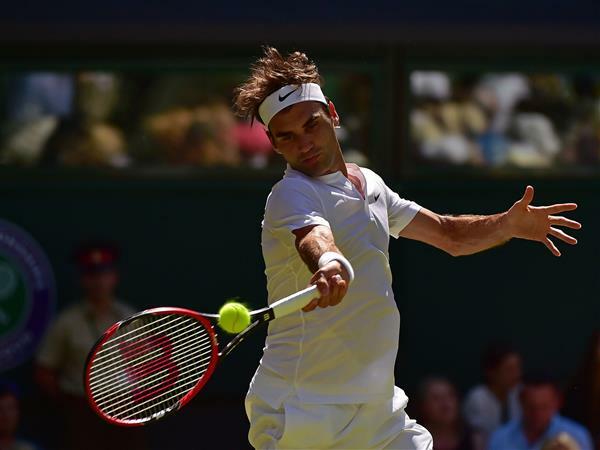 Roger Federer takes the second set 6-3 to surge ahead of Dzumhur and has already broken in the third to lead 3-1. Meanwhile, Laura Robson lost the first set in her battle with Evgeniya Rodina, and despite an early break in the second she gives it straight back to lose the advantage. On Court 12, Heather Watson is just restarting her delayed first round match against Caroline Garcia. Venus Williams and Serena Williams pulled out of the Wimbledon women's doubles on Tuesday. The announcement was made by the tournament referee's office. The sisters have won the women's doubles title five times, most recently in 2012. They had not begun their campaign this year. In 2014 they abandoned a second-round match when an unwell Serena Williams could not complete the contest. No reason was immediately given for Tuesday's withdrawal, with lucky losers Misaki Doi and Stephanie Vogt promoted to take their place in the draw. Both won their singles matches on Monday and they are seeded to play against each other in the fourth round. The Scot is now out on Centre and warming up on a delightfully sunny day. No 10 seed and 14-time Grand Slam champion Rafa Nadal is also into the second round after beating Tomaz Bellucci 6-4 6-2 6-4. 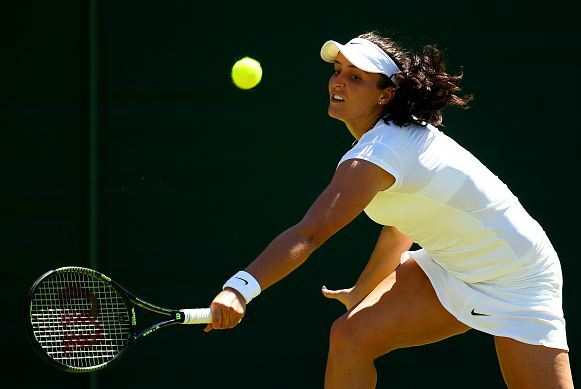 Unfortunately for British fans, Laura Robson has suffered a first round defeat to Evgeniya Rodina with a 6-4 6-4 defeat. We're underway on Centre Court, Murray is serving first... The Kazakh wins the first point with an impressive forehand after a brief rally. Murray then wins a couple of points back as Kukushkin hits a couple of shots too long. The Scot then takes the first game with an ace. The Kazakh causes Murray some early trouble with an accurate and powerful first serve, making the No 3 seed chase around the court, he then takes the game with some impressive forehands that the Scot just can't get to. Quick game for Murray who hits an ace and then gets the winning point with a lovely double-handed backhand across court. Elsewhere, heather Watson and Caroline Garcia are still at it, while Jo-Wilfried Tsonga has finally beaten Gilles Muller. Kukushkin holds again on the back of a strong serve. Murray drops a couple of points off some rallies but his serve is strong enough and he finishes with another ace. The Kazakh is no slouch with his forehand, he's really generating some power behind it. But a lose couple of shots later and an unforced error later and Murray was back in it. But Kukushkin held on with an ace and another strong serve that Murray was unable to return. Murray raced out to 40-0 but Kukushkin fought back with a couple of excellent shots that brought him up to deuce. But the Kazakh makes a really poor error with his backhand - a shot that has proved a bit of a weakness so far - and at advantage he overhits a return to give Murray the game. Kukushkin is causing Murray some problems with his serve but then gets rattled over an in/out call on the baseline. He follows that with a double fault before regaining his composure to win the game. Strong game from the Scot who serves another couple of aces and then forces his opponent into a couple of poor returns. Heather Watson into the second round after beating Caroline Garcia on a tie-break. SET MURRAY: The Scot gets out to 0-30 and has a break point almost in sight but it's snuffed out quickly, with the Kazakh's first serve causing more trouble. Murray then has set point but Kukushkin's serve is again good enough to bring him to deuce. The crowd favourite gets to advantage but is pegged back again and with a beautiful back hand down the line. With Murray again on advantage the pair engage in a lengthy rally before Kukushkin overhits a backhand just slightly to hand Murray the advantage. 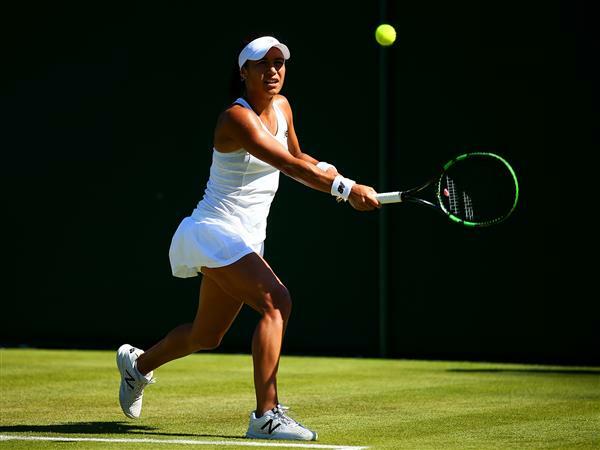 The IndependentHeather Watson pulled off her two-day comeback victory over Caroline Garcia to book a second-round clash with Daniela Hantuchova at Wimbledon. Murray continues to grow into this one with a quick win in game one. MURRAY BREAKS: Kukushkin is making it hard for Murray with the first serve but the Scot is now making his opponent really work, moving him from left to right around the court. After being 40-15 down Murray is looking at his best and eventually works to deuce and then takes the game. Murray's serve is really working now - he hits two in a row in the middle of the game before Kukushkin again has trouble with that backhand. Murray firmly in control now. Strong reply by Kukushkin who produces an other-worldly forehand to win a point. Murray then hits a needless error and suddenly the Kazakh is looking a bit lighter on his feet again. KUKUSHKIN BREAKS: Well, well, well. Great game there by Kukushkin, who pumps the air after a couple of strong forehands - plus some poor first service by Murray - brings him right back into the set. Big game coming up now. MURRAY BREAKS: Kukushkin really does have a nice forehand; the world No 59 is providing a stiff early test for one of the favourites of this competition with his power. But Murray is just too good for him and when he decides to ramp up the pressure the Kazakh is unable to provide much of an answer. A couple of needless errors in amongst that as well. "It doesn't feel hot at all. In America humidity is a big factor which can really fog your mind. Makes you tired. In Australia it is dry heat. Really hot. Burns through your muscle. Grass never feels this hot. Perfect conditions." Neither player seems especially keen on holding their own serve at the moment. Murray faces two break points before working his way back to win the game with a couple of nice drop shots and more Kukushkin struggles on his back hand. Kukushkin is certainly not allowing Murray to have this match too easily, holding on to keep the set going for at least another game. KUKUSHKIN BREAKS: Murray had the chance to win that game but Kukushkin controlled it , there were some poor first serves in that game from the Scot. This is shaping up to be a really good first round test of Murray's championship mettle. Kukushkin gets out to 40-0 but Murray comes back to deuce after a couple of favourable calls from the umpire and line judge. But he perseveres and hits some really sweet shots that have the partisan crowd cheering. Murray suddenly looks slightly more vulnerable. 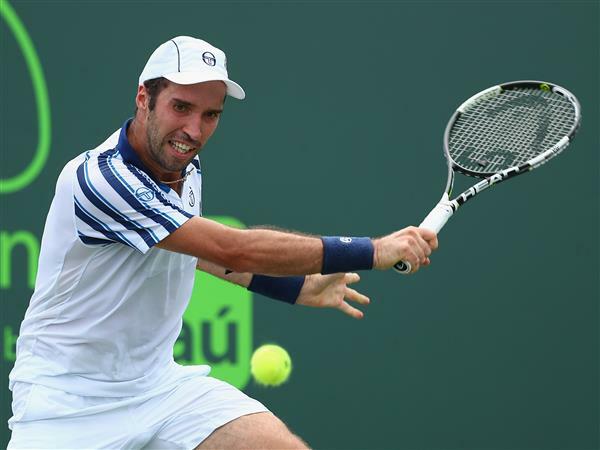 KUKUSHKIN BREAKS: Everybody panic! That was not a good game for Muzza and Kukushkin is really fired up, punching the air as he hits a beautiful shot down the line. Lots of work to do now for Murray who was up 3-0 at one point in this set, remember. MURRAY BREAKS: Kukushkin goes 30-0 up but then seems to freeze as it dawns on him that he's about to take a set off the Scot. He makes two really bad errors to give Murray break point and the Scot is able to seal it after a long rally and another error. SET MURRAY (2-0): Much, much better from the Scot, who moves into a higher gear to take control. Kukushkin has been a very worthy opponent but cannot get to the next level like the No 3 seed can. It took three set points but Murray was eventually able to put him away. He's now just a set away from the second round. Kukushkin seems to have run out of ideas. 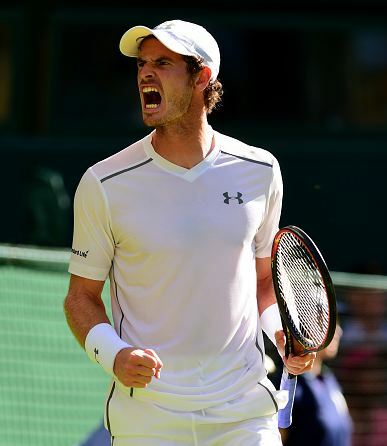 He raced into a 40-0 lead but Murray fights his way back forcing the server into a couple of errors. Kukushkin manages to hold but the Kazakh is starting to look leggy. Murray makes light work of that game, putting in an ace and then Kukushkin loses the game with a needless error on a return. His shoulders are starting to slump and although he has been a good opponent he looks like he's given up a tad. Better from Kukushkin there, but Murray is looking much more cheery on Centre Court. The Kazakh is holding on at the moment, even if his serve and strong forehand are keeping him in it. Another very quick game as Murray serves a couple of aces that Kukushkin can't get near. MURRAY BREAKS: It started off well for the Kazakh but he fails to keep the early momentum, hitting two errors to gift Murray deuce and then advantage - the Scot puts one foot into the second round with a strong backhand to win the game. Murray had the chance to put that game away early but took a couple of goes at deuce to finally win that game. Kukushkin is still doing his very best but this game hasn't got long to go now. A strong service game keeps Kukushkin in this for just a bit longer. Murray over-hit a couple of shots there as well and isn't overly impressed with himself. It's certainly hot at Centre Court - 41 degrees according to the thermometer down there!! I was cropping a picture and the game is over... I'd like to explain what happened but I didn't see any of it unfortunately. Murray won, though, and is now a game away from victory. Good game from Kukushkin, who pushes Murray around the court. The pair take a quick seat before what should - surely - be the final game of the day on Centre Court. GAME, SET, MATCH MURRAY (3-0): Well he got there in the end with that game - Kukushkin had three break points but Murray slowly but surely felt his way back and had too much when it went to deuce. Mostly impressive from the Scot who goes into the second round after beating an opponent who definitely tested him at times - just the kind of first round game you need to reach top form in a Grand Slam. 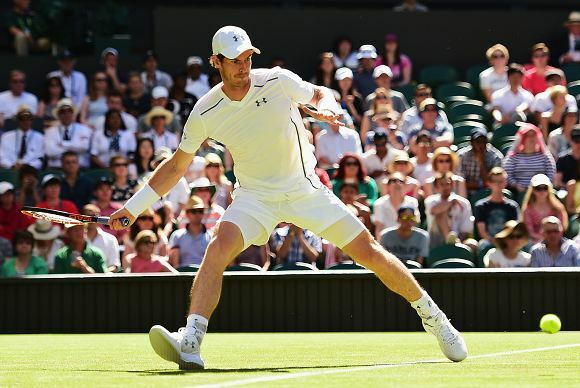 The IndependentGreat Britain's third seed Andy Murray has won 6-4 7-6 (7/3) 6-4 against Kazakhstan's Mikhail Kukushkin in the first round at Wimbledon. That's all from us this evening, thanks very much for joining our coverage.